In an effort to help further the cause of sainthood of Fr. 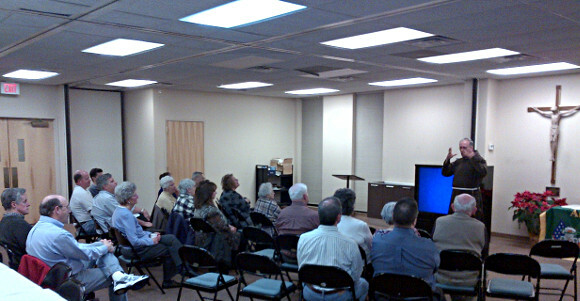 Solanus Casey, Bergen 32 recently conducted a public screening of a Fr. Solanus Speaker Series at St. Peter the Apostle Church Parish Center in River Edge, NJ. The three-part video series was produced by the Solanus Casey Center in Detroit, MI. Admission to the event was free and Bergen 32 provided attendees with a meal before the screening. Brother Roger Deguire, a Capuchin priest from Sacred Heart Church in Yonkers, was a guest speaker. Please contact Kevin Blute at [email protected] or 201-316-5022 to learn more about how your division can participate in this program to help advance this Irish American to become the first U.S. born male saint.